Saint John of Damascus is one of the most eminent Fathers and theologians of the eighth century, and also among the most important hymnographers. Saint Nikodemos the Hagiorite calls him a "beautifully-voiced" and a "quick sweet-versed" nightingale of Christ's holy Church. His texts include the entire dogmatic theology of the Orthodox Church. The hymns he wrote are chanted until today in the sacred churches and create devotion and spiritual exultation. Orphaned at a young age from his mother, his father Sergios entrusted his and his brother's upbringing to a most-revered and most-wise monk named Kosmas, whom he met in a slave market where he was being sold as a servant. He was impressed by the fact that he saw him sad and tearful and asked him why he was sad since he had chosen the narrow and sorrowful path of the monastic life. He replied that he sorrowed not because he was captured, but because he wasn't given the opportunity to cultivate and increase the talent that God gave him, and also because he could not utilize his gift for teaching and convey the knowledge he possessed. Then Sergios full of joy, having found what he sought, freed him and had him educate his children. In this way John was "taught arithmetic, geometry, music, rhetoric, dialectics and ethics according to Plato and Aristotle, and then theology." In Damascus his father held the office of logothetis "in the rule of the caliph Abd al-Malik". This position corresponds to that of a Minister in matters of the enslaved Christian population, especially on the division of taxes. After the death of his father, John took the office of head adviser, much like that of his father, and excelled in it. But he soon abandoned it and went to Jerusalem, where he became a monk at the Monastery of Saint Savvas. The same path was followed by his brother Kosmas the Melodist (adoptive son of Sergios), who later became Bishop of Maiouma. At the Monastery, his Elder "oversaw the combat he made with his ego, which John obviously had because of his education and secular position, and he was forbidden to write." However, at the request of fellow ascetics he composed the hymn "All Human Things Are Vanity", which we chant at Funeral Services. 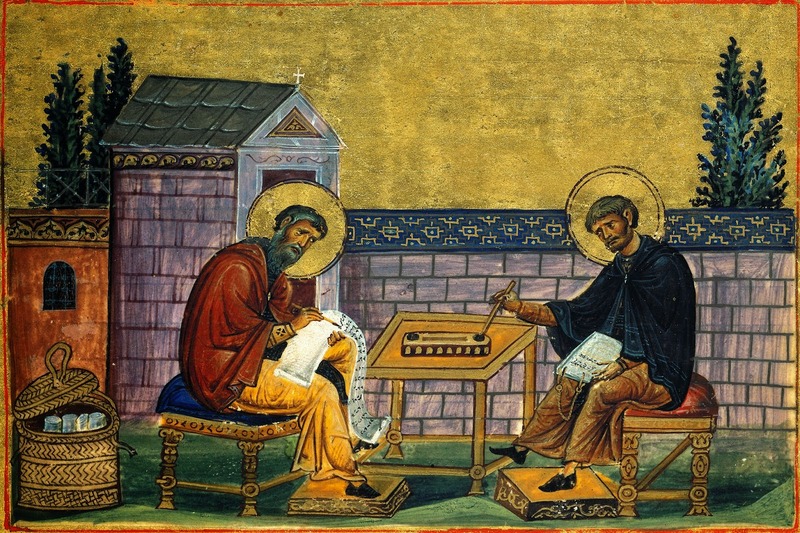 This incident caused him to be expelled from the Monastery, but then, after the intervention of the Theotokos, he returned and was allowed to write. He then wrote about the honor that is to be given to sacred icons and refuted the heresy of the iconoclasts, as well as other theological studies. At the same time he dealt with the composition of hymns, especially the Canons of Praise for the Despotic feasts as well as those of the Mother of God. Together with his brother Kosmas they "adorned, graced and sweetened the great Despotic and Mother of God feasts with their Canons of Praise and mellifluous and nectareous melodies, inspired by the grace and energies of the Holy Spirit, to the spiritual joy and gladness of chanters, readers and listeners among Christians." At this point I wanted to look at what Canons of Praise are, according to Saint Nikodemos the Hagiorite. First, the origin of the word "canon" is from κανόνιον or πήχυς and primarily refers to the wood used by artisans as a measuring standard for other wood, stones and the materials they worked with. This measuring rod would straighten whatever was twisted. From this metaphor comes the word "canon", which refers to the decisions of the Apostles, the Local and Ecumenical Synods and the Holy Fathers. Songs of praise are also referred to as "canons", because a Canon has a certain meter that cannot be deviated from. Each Canon has nine odes. An ode, according to Basil the Great, is "a harmonic and musical voice pronounced with the mouth without the accompaniment of a harp." It is called "ode" (ωδή) from the word "άδω", which means "chant". The Jews in the Old Testament sang with harp accompaniment. From the time God expelled the harp of the Jews, as spoken through the Prophet Amos: "Away with the noise of your songs; I will not listen to the music of your harps" (Amos 5:23), we Christians offer our hymns to God only with our voice. "There are nine odes because the number nine is the largest meter between numbers. Monads, decads and hecatads progress to nine, and other numbers are a synthesis of and recycle the nine numbers. The nine odes denote the nine orders of angels, since in the heavenly hierarchy there are nine orders and each order offers hymns to God, just as here below there are nine orders in the Church: Bishops, Priests, Deacons, Subdeacons, Readers, Chanters, Clerics, Monks and Laity, and each order sings hymns to God. The number nine is a symbolic type of the Holy Trinity, because the number nine contains a triple triad" (Eortodromion). Characteristic is the incident that occurred between the two brothers, that is, Saint John and his brother Saint Kosmas, on the occasion of writing the two Canons of Praise for the bright-bearing feast of the Resurrection of the Lord. I mention this because it reveals the authentic ecclesiastical ethos. Kosmas wrote the Canon of Praise in the Second Tone ("Come people let us praise"), and when John read it he praised him. Then John read his own Canon, which is known to us, in the First Tone. When he arrived at the hymn "Now everything is filled with light, heaven and earth and everything below the earth", "then the divine Kosmas was in complete amazement and surprise, and said: 'And you brother John, you included everything in these three (words), and you left nothing outside; hence I have lost, and I acknowledge my loss; therefore let your Canon have the primacy and the supremacy, and let it be sung publicly in the churches of Christ, and let mine stay in darkness and in the corner as unworthy of the light for both its content and its mourning and lamentful tone, in which it was composed, which is totally inappropriate for the brightest and world-joyful day of the Lord's Resurrection.'" These heavenly and sweet hymns, because they are prayers and doxologies to God, create gladness, devotion and spiritual joy in the soul. Source: Ekklesiastiki Paremvasi, "Η ΓΟΡΓΟΓΛΥΚΟΣΤΡΟΦΟΣ ΑΗΔΩΝ (ΑΓΙΟΣ ΙΩΑΝΝΗΣ Ο ΔΑΜΑΣΚΗΝΟΣ)", December 2001. Translated by John Sanidopoulos.